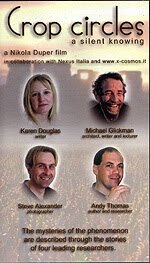 "Crop Circles : A Silent Knowing" is a very well put together video, and chooses to concentrate on the testimony of the individual as opposed to grand theorising conclusions as to the nature of the phenomenon. This is a very personal video, and Nikola conceived it, shot it, edited and designed it himself. As a professional film-maker of some standing, it is a pleasure to have these skills brought to bear on a subject so close to my heart. The video essentially revolves around a series of cameos by Andy Thomas, Karen Douglas, Michael Glickman and Steve Alexander, in which they all describe personal aspects of how their lives have been changed by a close interaction with the phenomenon, and what drew them to it in the first place. Again there is a huge shared store of experiences on which all these researchers can draw, and this video charts some of their more significant personal experiences. Steve's video of a ball of light below Milk Hill in 1990, the giant Alton Barnes pictogram which put the crop circle phenomenon firmly on the map, and the Sussex team's attempt at tangible extra-dimensional communications are all touched on. We hear, for instance, the astonishing story of several large luminosities that were all seen on the same evening by Andy, Karen and Steve respectively. 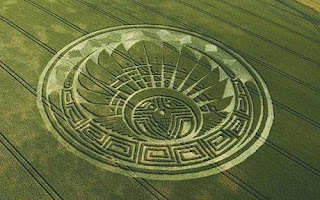 Unbeknown to each other, they had all independently been involved in crop circle meditation work around the same time, and the video charts the details of this little known story. The video's strength, though, is the emphasis it puts on the power of personal testimony and the fact it chooses to explore the sociological aspects of the phenomenon, as opposed to the purely objective aspects like bent nodes, magnetic anomalies and the like. These four seasoned researchers, with (I estimate) about 50 years experience between them, talk about how they've been affected by the phenomenon and where they feel it all might be leading. Again, there are several amusing anecdotes which keep the mood light and very down-to-earth. 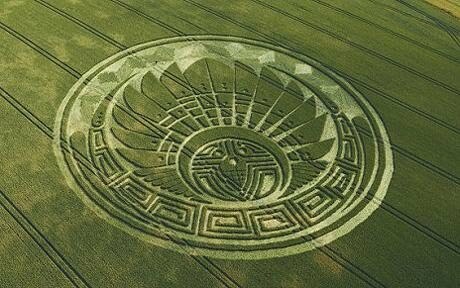 "The Mayan / Quetzalcoatl Headdress Crop Circle"